The “Five Freedoms” are contained in the BC SPCA Charter and express the dedication of the BC SPCA ensuring that all animals are healthy, happy and cared for. “Well-Being includes both emotional and physical health”. All animals will and do suffer extreme stress, just as do humans, when their basic needs are withheld from them. Just as in humans, physical and mental trauma, food/water deprivation, and their surrounding environment play a key role in the emotional and physical well-being of an animal. Animals respond very much the same way that humans do to their surroundings and to the way they are treated. Those that are abused, beaten, tortured and abandoned experience fear, despair, hopelessness and worst of all pain. Pain not only from the physical but emotionally as well. While physical scars may heal in time, the memories of their abuse, neglect and mistreatment remain. Anyone who has rescued/adopted a severely battered or neglected animal knows this. 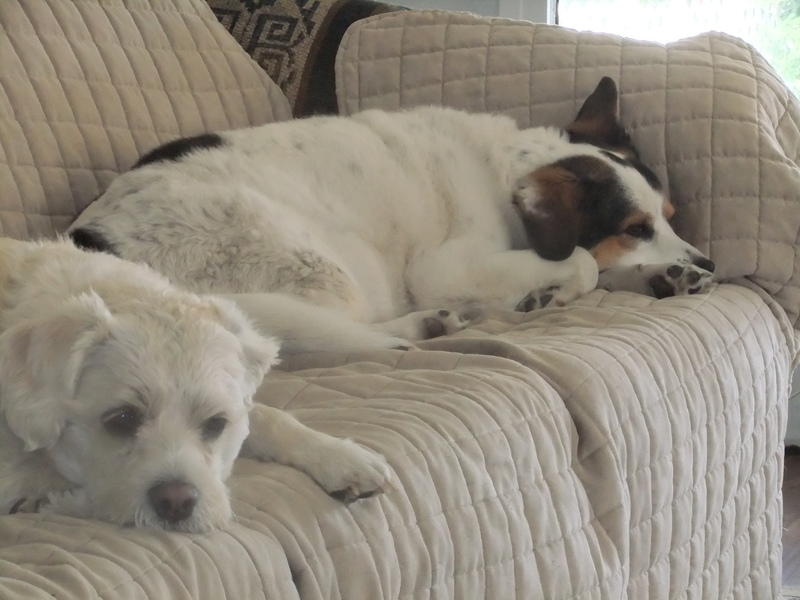 My own canine companions are clear evidence of the emotional suffering they endured. Animals also experience joy, contentment, enthusiasm, curiousity and playfulness. As the Pack Leader, the Alpha in your home, your dog looks to you for guidance, interaction, education, comfort and protection. If injured or frightened he/she will come to you for comfort and help, happy to see you when you come home, the excitement is evident in tail wagging and displays of affection; grabbing the leash or jingling the car keys and you are witness to an explosion of enthusiasm; throw a ball, walk, run, play tug of war and experience the exuberance of your own youth and that of your companion. Cats while often aloof, will snuggle up content and the purring begins. Animals also experience the pain of losing a loved one. Devoted dogs and cats have been known to ‘pine away’ at the death of a beloved owner. Refusing to eat, falling into deep depression, remaining by that favourite chair of the deceased, refusing attempts to play or interact. Ever so slowly they will die if their spirits cannot be uplifted. All animals, be it dogs, cats, birds, pet rabbits or ferrets to just name a few, very much need interaction with their human parents. They need your reassurance that they are loved, cared for, safe and more importantly respected. As a parent you are responsible for providing their every need. Their emotional and physical well-being is dependent upon you. The more time you spend in pleasurable interaction with your animal companion, the stronger the bond, the greater the devotion and of course that unconditional love you will receive. The Following is a summary of the existing Federal Criminal Code, Animal Cruelty Act: Bill S-203. The Criminal Code is the Federal Law that is in force everywhere in Canada and which applies to every person in Canada. “If you cause something to happen, either by doing it or by not doing something you should do, and you know what the results will be, you are considered to have done so “willfully”. (Examples: which may be considered to be a “willful” act: failing to feed an animal could be, since you know that an animal will starve if it is not fed. Failing to provide proper shelter to protect animal from elements, leaving an animal in a vehicle during hot summer, not providing clean fresh water on a daily basis resulting in dehydration, depriving a sick /injured animal of medical care. Beating and/or abandoning an animal). Any person found guilty under Section 446 of the Criminal Code can be fined up to $2,000, sentenced to up to 6 months in jail, or both. In addition to this, the Judge can make an order prohibiting that person from having an animal or animals for up to 2 years. c) An animal not being provided with daily ongoing fresh supplies of clean watercan and will suffer from dehydration. Fresh water does not mean a pool of dirty rainwater or 2-3 week old water left in a slimy bowl or bucket. Those that own the animal or individuals who have control or custody of the animal. Important to note that while some communities within the N.W.T. do have By-Laws pertaining to the standard of care for animals, as well as By-Law Officers whose job it is to enforce these Municipal By-Laws and the current N.W.T. Dog Act (soon to be revised January 2010) it must also be noted that under the current N.W.T. Dog Act: R.C.M.P. are “exacto”. This means that by virtue of the legal authority held by RCMP to uphold all aspects of the Federal Criminal Code including the Federal Cruelty to Animals Act and the N.W.T. Dog Act charges can be laid for violations not only under the Federal Criminal Code but the current N.W.T. Dog Act as well. “70% of total body weight is composed of water”, any animal/human suffering Dehydration is, if left untreated, facing a horrific death. All bodily functions depend upon a proper electrolyte balance. When Cells begin to lose their water content, electrolyte imbalance takes over, the needed H2O oxygen normally circulated by electrolytes becomes depleted, gradually organs begin to shut down. Left untreated, the animal/human will die. Starvation: (Underweight, skin and bones, poor coat condition, immune deficit, skeletal structure visible, weak, lethargic) due to the failure to provide proper and adequate nutrition to the animal. This constitutes willful neglect. A horrific and lengthy way to die as the animal’s own system begins to feed on its own muscle tissue and bone marrow. Hypothermia (decreased body temperature): due to lack of proper protection and shelter and extreme climate changes: “Any reduction in body temperatures results in system slow down. Eventually, the body cannot remove toxic wastes nor produce energy and it ceases to function”. The very same process in humans. Hyperthermia (increased body temperatures): due to lack of proper shelter, being left inside vehicles during summer, lack of backyard shade.